SAN ANGELO, TX -- Thunderstorms dumping heavy rainfall are forecast to spread across West Texas this weekend causing widespread flooding across the region. The National Weather Service has issued flood warnings for McCullough, Mason, San Saba and Kimble Counties for Friday morning. 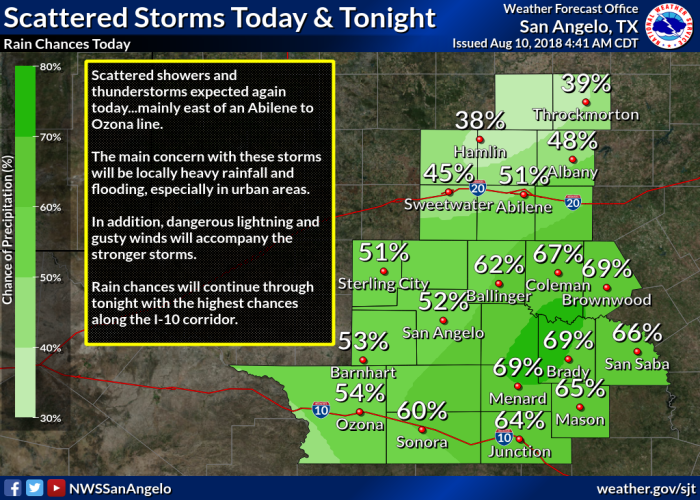 The forecast is calling for scattered showers and thunderstorms again today mainly east of an Ozona to Abilene line. The main threat with these storms will be locally heavy rainfall and flooding especially in urban areas. Through early morning, scattered showers and thunderstorms will affect areas generally east of a Brownwood, to San Angelo, to Sonora line. Some of these storms will contain heavy downpours, which may cause localized flooding, and reduced visibilities, so caution is advised for drivers on area roads. In addition, gusty winds and cloud to ground lightning will also be possible. Scattered thunderstorms are expected this afternoon into tonight, especially along and south of Interstate 20. The main hazard will be heavy rainfall that could result in localized flooding, especially in urban and low lying areas. Dangerous lightning and gusty winds will also accompany some of the storms this afternoon and evening. Scattered to numerous showers and thunderstorms will affect West Central Texas Friday through Monday, with heavy rainfall being the main concern. The heavy rainfall may result in flooding, especially of low lying areas, roadways, and low water crossings. Dangerous lightning and gusty winds will also accompany some of the storms. There is a 50 percent chance of rain today through Saturday with chances increasing to 60 percent for Sunday and Monday.